Thanks to grassroots efforts of local citizens, and the Waukesha County Park System, an official Dog Exercise Area is on the horizon at Waukesha County’s Mukwonago Park, County Hwy LO, in Mukwonago. The Waukesha County Department of Parks and Land Use has $50,000 in the 2013 parks operational budget, for this project but needs an additional $25,000 from private-fundraising to contribute to development of the Dog Exercise Area. Based upon previous experience in the building of Dog Exercise Areas, costs have ranged from $50,000 to $100,000, depending upon necessary changes needed in the park. However, the proposed project area takes advantage of an existing, under-utilized picnic area, park roadway, parking area, gentle slopes, and shade trees, thereby minimizing development costs. Once the $25,000 is raised work on the area can begin. 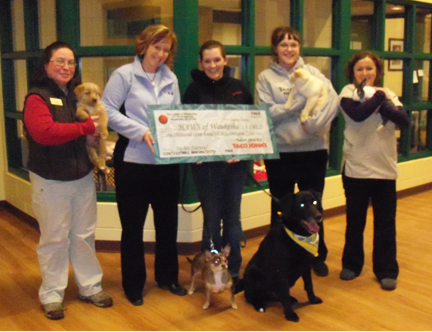 This past September, the community and their four-legged friends, were invited to attend a “Meet & Greet” at Mukwonago Park. Attendees got to see the proposed maps, ask questions, and bring suggestions to the county. County Executive, Dan Vrakas, highlighted the benefits of having a place for dogs and their people to meet. He talked about the success of the County’s other two dog exercise areas located inside Minooka Park and Nashotah Park. “Our current parks’ dog exercise areas provide our residents, visitors, and their canine companions with another wonderful recreational opportunity,” stated Vrakas. The September “Meet and Greet” was also the official kick off of the fundraising efforts. Fundraising volunteers are working with businesses to set up events to spread the word and raise funds. Everyone is welcome, and encouraged to help with fundraising efforts. Flyers can be obtained by messaging the “Dog Exercise Area at Mukwonago Park” Facebook page, and maps of the proposed exercise area can be seen at End of the Leash, 214C S Rochester Street in Mukwonago, and at the PyraMax Bank in Mukwonago. The Facebook page is the best place to catch up on the latest fundraising efforts and events. And the next fundraising event is Mukwonago’s Annual Midnight Magic Event on Saturday, December 1st. Clifford the Big Red Dog will help promote fundraising by walking in the parade and there will be an information table set up at End of the Leash where volunteers can answer questions and accept donations. PyraMax Bank: http://www.pyramaxbank.com/branchlocations/mukwonago/405 River Crest Court, Mukwonago, WI 53149, (262)363-3021, or either End of the Leash location 214C S Rochester Street in Mukwonago or theirnewest location at 115 W Wisconsin Avenue in Pewaukee. For more information about Minooka Park and Nashotah Park Dog Exercise Areas please visit the website at http://www.waukeshacountyparks.com. I would like to let you know about an important health concern in our pets. Although this is not a new concern, it is one that is often overlooked by pet owners, humane shelters, groomers and veterinarians. The concern is about breast cancer in dogs and cats. We don’t have mammograms, radiation and chemotherapy, but breast cancer is the number one cancer we see in dogs. It is the third type of cancer in cats. Most pet owners are unaware of this. In dogs, 50% are malignant, but over 90% of these are malignant and rapidly fatal in cats. We need to know more about this disease – research is essential. I want our veterinary technicians and groomers to know how to teach clients to do monthly exams for breast cancer (too often called mammary tumors to the confusion of pet owners). This early detection is key to saving lives. Here’s a link to the client education article and the pdf that people can print. It’s the first article in what is going to be VIN’s new “Entertaining While Educating” corner of Veterinary Partner. 1. Each female dog and each secure male dog who visited our practice this month received a breast cancer bandana. 2. Visitors will receive a string of 12 pink breast cancer stickers to put on their calendar, along with their stickers for flea and heartworm medication reminders. This is a way to remember to feel for the lumps –for themselves and for and their dogs and cats. Early detection is essential. 3. WE discussed the benefits of spaying with clients regarding the prevention of breast cancer. Teaching clients to feel for lumps along the mammary chain. Clients learned how to feel for lumps along the mammary chain and hear about the benefits of spaying regarding the prevention of breast cancer. 4. Provided a free breast exam by a doctor to each dog who visited us in October – for 6 months – to help clients distinguish between mammary tumors (breast cancer) and other less serious lumps. 6. 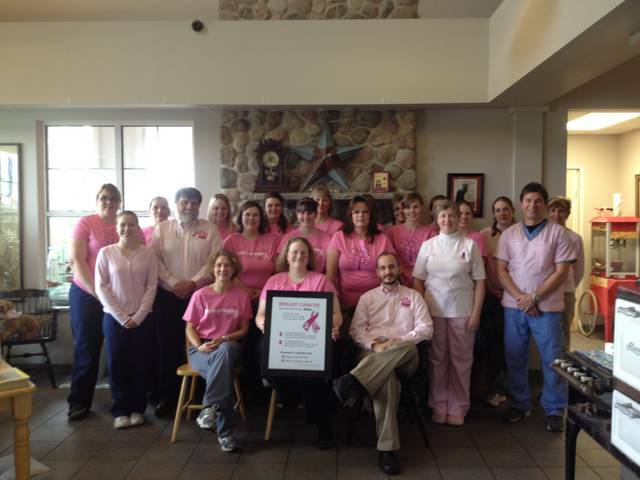 Staff members wore pink breast cancer awareness t-shirts instead of their usual scrubs. Please feel free to contact me or visit us if you would like more information. I would love for this to become a national campaign for the health of our pets. PSCPets.com and Customers help “save the lives of dogs to enrich the lives of people”. PSCPets.com, a leading online supplier of health and wellness products for pets, has teamed up with The Sam Simon Foundation to help support the dogs they rescue. Throughout the month of November 2012, PSCPets.com will be partnering with their customers to donate bottles of PSCPets Intellifora to help the dogs maintain a healthy digestive system during times of stress. The Sam Simon Foundation was founded in 2003 to rescues dogs awaiting euthanasia. After these dogs are rescued from various shelters they are trained to become service dogs to assist war veterans with PTSD, and hearing dogs for the hearing impaired. Dogs are selected by trainers to enter the new cage-free living environment on 6 acres in Malibu, California in which they receive general house manners and socialization skills for various public places. All service dogs are placed in homes of California residents free of charge. During the month of November, for every $2 that a customer donates to the Rescue Outreach Program, PSCPets.com will donate a bottle of PSCPets Intellifora which retails at $14.99. PSCPets Intellifora is a nutritional supplement that contains four live, active strains of beneficial bacteria to help to manage pet digestive health. Complete details about this Rescue Outreach Program can be found online. For those who wish to participate and help PSCPets.com support the Sam Simon Foundation can go to PSCPets Rescue Outreach Program or call the PSCPets.com Customer Service Team at 1.888.873.9719. The holiday season is just around the corner! Celebrate the beginning of the holidays, and help a Golden Retriever rescue raise funds to help its dogs! Wisconsin Adopt A Golden Retriever (WAAGR) has scheduled its annual Goldens Holiday House for Saturday, Dec. 1, from 10 a.m. to 4 p.m. WAAGR, an all-volunteer/member Golden Retriever rescue organization serving southeastern Wisconsin and beyond, will host the event at the home of one of WAAGR’s founding members, N61 W12851 Hemlock Court, in the River Heights South subdivision, Menomonee Falls, Wis. The home will be decorated with approximately 30 themed trees, including a Golden Retriever tree, a Wizard of Oz tree and a tree dedicated to Jolly Old St. Nick himself. WAAGR member Barb Hart, who hosts the event with her husband Jim, begins decorating her home for the event in September. The event also will feature a baked goods sale, silent auction, complimentary refreshments, and plenty of Golden Retrievers to greet attendees. A $5 donation is requested to attend the Goldens’ Holiday House, with kids under 12 admitted for free. All proceeds from the event go to help the Goldens in WAAGR’s care that are awaiting new homes. As part of an ongoing effort to keep animals safe, Pet Poison Helpline offers several ways for pet owners to learn about dangerous and potentially deadly poisons that lurk in their homes and gardens. Already downloaded by thousands of pet owners, Pet Poison Helpline recently launched an iPhone app that has an extensive database of more than 200 plants, household items, foods and drugs that are poisonous to pets. Also, just in time for the upcoming holidays, Pet Poison Helpline will be hosting its first ever webinar specifically for pet owners on “Holiday Dangers Poisonous to Pets” on Dec. 3, 2012. Pet Poison Helpline’s handy iPhone app, called “Pet Poison Help,” puts life-saving information at the fingertips of pet owners, whether they are at home, on the road, or somewhere off the map without cell service or internet access. It contains an extensive database of more than 200 foods, drugs, household cleaning supplies and plants commonly found in the home and yard that are poisonous to pets. Each toxin has a full color photo, description, list of symptoms, and a bright yellow banner that indicates the severity of the toxin, from “mild to moderate,” to “moderate to severe.” The app also features a powerful indexing tool that allows users to search for toxins, cross-referencing them by poison type and animal species to make it easier for owners to see what toxins are poisonous to their specific pet. Pet Poison Help is available on iTunes for $1.99. More information is available here. For pet owners who don’t have an iPhone, Pet Poison Helpline suggests bookmarking www.petpoisonhelpline.com on any smartphone for immediate access to pet poisoning information. On Monday, Dec. 3, at 12 p.m. CST (1 p.m. EST, and 10 a.m. PST), Pet Poison Helpline will host its first-ever webinar for pet owners entitled “Holiday Dangers for Pets.” The webinar will provide useful and valuable information about the many toxic substances that can threaten pets during the holiday season. It will be a jam-packed, hour-long session that will cover “must know” topics that pet owners can watch from their own computer. Myths will be busted, such as the age-old belief that poinsettias are poisonous when they are actually quite benign. Also discussed will be significant poison threats to pets including unbaked bread dough (can cause alcohol poisoning and severe bloating of the stomach), macadamia nuts (can cause a temporary paralysis), and caffeine. Additional common holiday foods and popular decorations that are dangerous, like tinsel and liquid potpourri, will be covered. Presenting from Pet Poison Helpline will be assistant director of veterinary services, Dr. Ahna Brutlag, DVM, MS, and Dr. Justine Lee, DVM, DACVECC, associate director of veterinary services. There will be a question and answer session at the end of the presentation where pet owners will be able to ask the experts additional questions, which will be answered immediately. This is a great opportunity to ask a veterinarian directly about any substances poisonous to pets. Registration is $10 to help cover the costs of the webinar. Pet Poison Helpline will be donating a portion of the proceeds to Best Friends Animal Society, a national animal welfare organization. For more information and to register for the webinar, click here. Knowledge is power and Pet Poison Helpline suggests that pet owners use these opportunities to educate themselves as the holiday season approaches. If faced with a potential pet poisoning, the veterinary and toxicology experts at Pet Poison Helpline suggest that it’s always easier, less expensive, and safer for pets to be treated earlier, versus when they are showing severe symptoms. Pet Poison Helpline is the most cost-effective animal poison control center in North America at only $39 per call, including unlimited follow-up consultations. TACO JOHN’S: HAPPY HOLIDAYS TO HAWS! HAWS, the Humane Animal Welfare Society of Waukesha County, has again been chosen to benefit from the December “Nachos Navidad” promotion and through sales of Christmas ornaments at the Waukesha Taco John’s restaurant at 317 N. Grand Ave.
Nachos Navidad billboards will be posted November 12th, marking the day Taco John’s will begin selling their $1 holiday ornaments for HAWS. Then, starting December 1st and continuing throughout the month, 25 cents from every Nachos Navidad sold at the Waukesha eatery will be donated to HAWS. For those with spare change in their pockets, Taco John’s will also have collection jars for HAWS. A team of three dynamic young canines – Dogues de Bordeaux named Li’l Abner and Stella and a Staffordshire Terrier/Boston Terrier mix named Vivian – will step forward this year to carry on the tradition of The National Dog Show Presented by Purina Therapy Dog Ambassador program. The trio, all from the Philadelphia area, will carry on the work of the show’s previous Therapy Dog Ambassadors, the late Rufus and Eli. Rufus is the Colored Bull Terrier who won both the National Dog Show (2005) and the Westminster Kennel Club Dog Show (2006). Eli is the Belgian Sheepdog who is believed to be the last surviving canine to do therapy work in the aftermath of the September 11, 2001, terrorist attacks. Beloved working therapy dogs and media favorites, Rufus and Eli both passed away unexpectedly this year. Owned by insurance agent and therapy dog advocate Steven Kramer of Langhorne, PA, Lil’ Abner (right) is a 135-pound behemoth and Stella weighs in at a more feminine 120. Both are purebreds certified by Therapy Dog International to work at schools and healthcare facilities. Vivian, who weighs 40 pounds, comes to the National Dog Show Therapy Dog Ambassador Team from The University of Pennsylvania School of Veterinary Medicine (PennVet) VetPets Therapy Dog Program. She spent three months at the Philadelphia Prison System, as part of the “New Leash on Life” Prison-dog program. The program prepares prisoners for transition to the outside world and Vivian was trained and cared for by a group of soon-to-be-released inmates. At the end of that period, Vivian (right) was adopted by Michele Pich of Glassboro, NJ, a Veterinary Grief Counselor at PennVet. Vivian now helps Michele comfort grieving pet lovers in need of canine-assisted therapy and visits the children at the Ronald McDonald House regularly. In addition to their regular therapy appearances, the trio will handle several publicity assignments, including appearances on Philadelphia TV shows and NBC’s Today show in New York City, working with John O’Hurley and David Frei, the co-hosts of the Thanksgiving Day special, “The National Dog Show Presented by Purina.” L’il Abner, Stella and Vivian will meet and greet thousands at the Ronald McDonald House exposition booth during The National Dog Shows at the Greater Philadelphia Expo Center in Oaks, PA, Saturday and Sunday, Nov. 17-18 (www.nationaldogshow.com). Li’l Abner, now two years-old, has been doing therapy work at the Philadelphia Ronald McDonald House, St. Mary’s Hospital in Bucks County and at Bristol Township Schools since he was one. 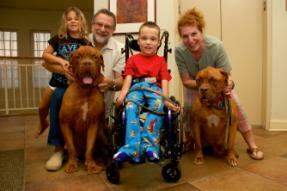 Last year, he competed in the National Dog Show, winning a Blue Ribbon in the novice Dogue de Bordeaux class. Four year-old Stella and Abner almost always do their therapy work together, creating a memorable 255-pound experience whenever they walk into a room. Vivian, now 22 months, is also certified by VetPets and participates in all of the PennVet Therapy Dog Programs. Vivian has her American Kennel Club (AKC) Canine Good Citizen Certification. All three members of the National Dog Show Therapy Dog Ambassador Team make regular visits to the Philadelphia Ronald McDonald House. The National Dog Show Therapy Dog Ambassador Team will be in the spotlight Thursday, Nov. 8, when the Philadelphia Ronald McDonald House hosts the annual pre-event press conference at the facility on Chestnut Street in Center City. The Philadelphia Ronald McDonald House Therapy Dog Program was started nearly 20 years ago and now encompasses close to 15 regularly scheduled volunteers between both House locations in Philadelphia . The Philadelphia Ronald McDonald House is the world’s first, founded in 1974 by the work of Dr. Audrey Evans, former pediatric oncologist from The Children’s Hospital of Philadelphia and former Eagles General Manager, Jimmy Murray. There are now 317 Ronald McDonald Houses worldwide.